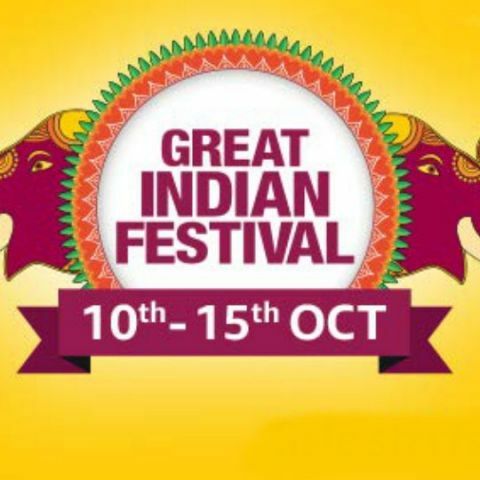 The Amazon Great Indian Festival sale starts at 12PM on October 10. The e-commerce giant is offering huge discounts on iPhone X, Amazon Echo Dot, and more. Amazon is kicking off its biggest Great Indian Festival Sale on October 10 at 12 PM, with Prime members getting an early access to deals on October 9. The sale is featuring hundreds of discounts and offers on a wide range of gadgets across all major product categories. The sale will open for non-prime members from October 10 and will run for five days till October 15. Here take a look at some of the best deals that are currently going on Amazon's Great Indian Festival Sale. The 64GB variant of the Apple iPhone X is now available on sale with a Rs 21,901 discount. Buyers will also get a 10% cash back when they pay using SBI debit or credit card along with an extra 10% cashback on any prepaid order above Rs 6,000. The phone features a 5.8-inch OLED display with a resolution of 1125 x 2436 pixels. The device comes with a 12MP rear camera and a 7MP camera on the front. Click here to buy. The OnePlus 6 is a pretty good device and already a great value for money even at a price of Rs 34,999. But as it is a festive season, the device is now available with a flat Rs 5,000 cashback, this is the first time ever the OnePlus 6 is on sale. The device is powered by a Qualcomm Snapdragon 845 octa-core processor, which is paired with a 6GB RAM and 64GB internal memory. The smartphone comes with a dual 16MP + 20MP rear camera and a 16MP unit on the front. Click here to buy. The Xiaomi Redmi Y2 is a quite popular smartphone in a mid-range segment. The device is available for Rs 10,999 on the Great Indian Festival Sale. buyers can get this phone for as low as Rs 8,800 (appx). The smartphone features a 5.99-inch display, which offers a resolution of 720 x 1440 pixels. The phone is powered by a Qualcomm Snapdragon 625 octa-core processor, which is paired with a 4GB RAM and 64GB internal memory. Click here to buy. Samsung’s flagship model, Galaxy S9 is available at a discounted price of Rs 42,900. Buyers can also opt for 9 months no cost EMI option on this purchase and will also get a guaranteed exchange price. The Samsung Galaxy S9 was launched in India with a price tag of Rs 57,900. The smartphone sports a 5.8-inch Super AMOLED QHD+ display and runs on Samsung Exynos 9810 processor. Click here to buy. The Honor Play is also available at a discounted price on the Great Indian Festival sale for Rs 18,999. The discount on this smartphone is pretty much less in comparison to the other smartphones on the list. However, interested buyers can get an additional 10% cashback on using SBI cards and 10% extra on a purchase of this device through a prepaid mode of payment. Click here to buy. The Vivo V9 Pro is powered by a Qualcomm Snapdragon 660 octa-core processor. The device packs a 6GB RAM and 64GB internal memory. It comes with a 6.3-inch display with a notch at the top of it. The device is available on Amazon with a Rs 2,000 discount during the Great Indian Festival Sale. Click here to buy. The Amazon Echo Dot (3rd Generation) is the new version of the most basic Alexa powered echo speaker. This smart speaker connects to the cloud-based assistant Alexa, which plays music, check the weather, order food, and lets you control smart devices of your home via a voice command. It can also connect to other speakers to give them Alexa's intelligence. Click here to buy. The Amazon Fire TV Stick turns your old dumb TV into a smart one. The device connects to your TV via an HDMI cable and lets you access apps like Netflix, Voot, Hotstar and a lot more. The device was launched in India at Rs 3,999. Click here to buy. Click here to buy.